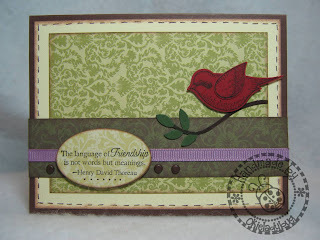 When I had my online Stampin Up party a few months ago I had planned on ordering this stamp set but I didn't have to since it was in the Sale-A-Bration catalog and I was able to get it for free! 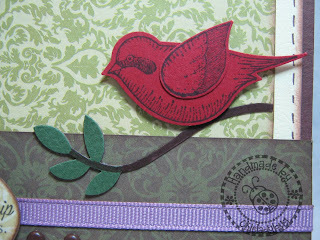 The bird punch is one of the Stampin Up punches that have several cuts in one punch and while this makes it nice it can also make you waste paper. What I do is measure the particular item I am wanting to punch and then cut strips of paper to put through the punch so I don't waste precious paper *okie looks over at her Ikea unit and wonders if wasting a little would even matter*. I punched the branch/leaves out of green and then colored the branch with Chocolate Chip SU marker. I pop dotted the bird off the branch for dimension. I didn't put a whole lot of thought into the card and it isn't one of my favorites. At the time I made it I was just wanting to try out the stamp set with the punch. That bird punch is one of my favorites. It's easy to use and you can get a card done quickly that looks really good too! I ordered the stamp set this weekend at an SU party that I attended. I had purchased the punch awhile back for other purpose. Good job in creating that card. Your card looks great! I love this punch too. 25% OFF - CONSUMER CRAFTS! Have I Told Ya'll Lately I Do Dumb Stuff? Got My First Blitsy Order!! That Dang Ol' Linda....Stupid Leap Day!